In a big push to Digital India, the Department of Telecom (DoT) has now announced that the mobile subscribers in the country would be able to pay for their digital content purchases up to Rs. 20,000 using prepaid balance or postpaid mobile bill. This move comes at a time when many are still struggling to adapt to various digital payment tools. Life became difficult for those who did not know how to use debit cards for making payments online and at PoS at merchant outlets. People had to learn about card payment system, which resulted in a huge spike in the number of card payments post demonetization. Besides card payments, mobile devices can also be used for purchasing items via payments apps, mobile wallets, and bank apps. However, this latest DoT announcement aims to enable people to pay directly via their mobile balance or bill without involving the usage of any other payment methods stated above. 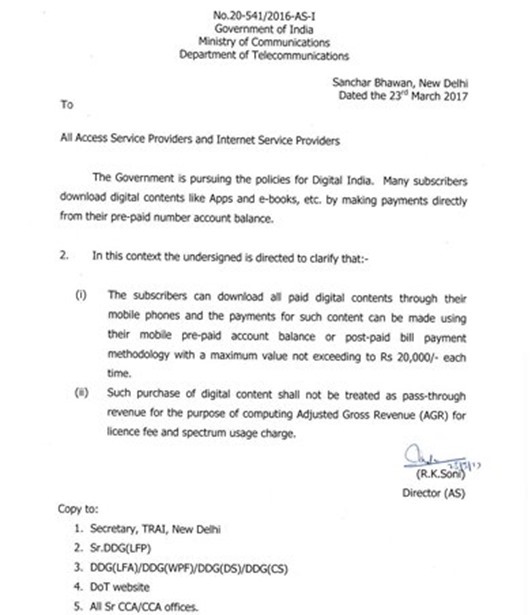 In this circular, DoT mentions that the subscribers can “download all paid digital content through their mobile phones” and the payments for such content can be made using their mobile prepaid account balance or postpaid bill payment methodology. However, the maximum amount of purchases that can be made using this method is restricted to Rs. 20,000. DoT also notes that these purchases (made via the carrier) will not be deducted from the telecom operator’s total revenue for calculating the Adjusted Gross Revenue (AGR). Why We Need Carrier Billing In India? Unlike the Western countries, plastic cards penetration is very low in India. On the other hand, the mobile phones have a very high penetration in the country as compared to credit/debit cards. This means there are still a lot of people who do not own a credit/debit card but own a mobile phone. A large gap still exists between digital banking literate and mobile literate. And it is this gap that the DoT wants to fill with this announcement. Using prepaid balance or postpaid bill, people would now be able to make digital content purchases without using credit/debit cards and internet banking. In order to pay for their digital purchases (apps, e-books, music, games, and more) the users will have to register their mobile number with the app store. Kindly note that Apple App Store and Google Play Store already support payments through mobile phone billing, but Apple’s App Store support for mobile billing is limited to Austria, Belgium, Germany, Italy, Japan, Norway, Russia, Saudi Arabia, Singapore, Switzerland, Taiwan, and the UAE. Open Google Play app and go to Account -> Payment Methods -> Add Payment Method by clicking on the “+” sign -> Pay using (service provider). Input the verification code sent to your mobile number and your new payment method will be activated. This payment method will be immensely useful to those who do not know how to use debit/credit cards but wish to purchase digital content. DoT has not clarified as to which services would be able to offer mobile phone billing as a payment option. Is it just Apple App Store and Google Play Store or would this service be extended to other digital content portals like Hotstar, Gaana, Saavn, Netflix, Amazon Prime Video, etc. as well? We will keep you updated as more information comes in. Stay tuned! "Now Pay Up To Rs. 20,000 Via Mobile Prepaid Balance Or Postpaid Bill For Your Digital Purchases", 5 out of 5 based on 1 ratings. Snapdeal Vacates 60% Of Gurgaon Office Amidst Cash Crunch; All Eyes Now on the Merger With Flipkart! so this also then paves the way for the carriers to sell handsets bundled with the SIM cards. but then would the telecom carriers work on a MDR of 0.5% for these payments – the same as we have for online / card based purchases ?